Since there are so many wonderful recipes on Pinterest, we’ll feature a new and different recipe from time to time, that we have found on Pinterest. A recipe that we fell in love with and just had to make. (like these marshmallow krispie leaves) In the first paragraph, after the name of the recipe we’ll write a “Pinterest Recipe.” This way (you) our readers will know that the recipe was found on Pinterest. Who knows maybe you’ve even seen a recipe on Pinterest and have always wanted to make it yourself or maybe you have already made the recipe. Lightly butter a large baking sheet. (12 x 17) Set aside. For each color use: 3 tablespoons butter, 3 cups mini marshmallows, and 3 cups rice krispie cereal. For each color: Melt 3 tablespoons butter in a medium saucepan. Add 3 cups mini marshmallows, stirring until completely melted. Remove from heat, add a few drops of gel food coloring, until you reach desired color, stirring constantly. 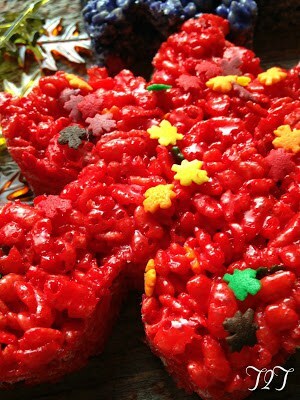 Stir in 3 cups rice krispie cereal, stirring until cereal is completely coated. Pour mixture into prepared pan. Press mixture firmly into pan, in a row, with a buttered spatula, using only a quarter of the pan. 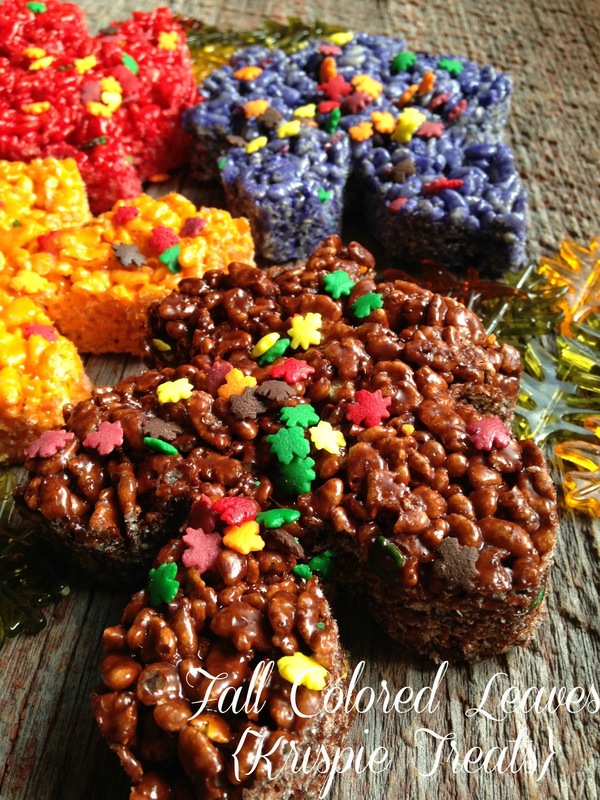 (All four colors of krispie treats will fill the pan.) 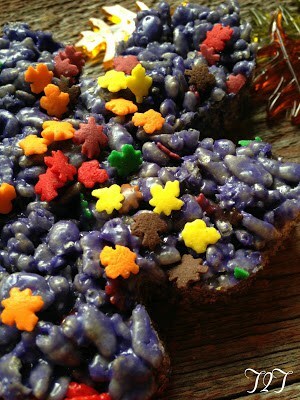 Repeat until all colors are used and pan has 4 rows of colored rice krispie mixture. 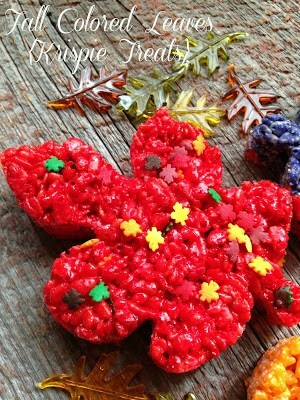 You can easily combine the remaining rice krispie scraps and cut out several multi-colored leaves. Love this. A great idea. 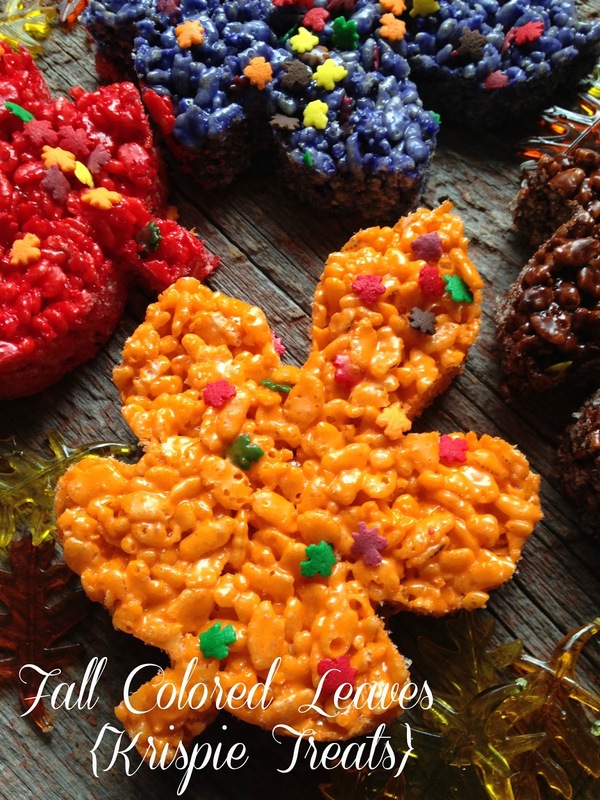 My grandson would love to make these! Come over and link up at The Fabulous Fall/Thanksgiving party!